Join us on this fantastic trip to Roatan February 1-8, 2020 … one of the most popular destinations in the Caribbean! Roatán is a Caribbean island about 35 to 40 miles off the north coast of Honduras in Central America. It is 40 miles long and less than 4 miles wide at its widest point. Surrounded by warm Caribbean waters, this hilly island is beautiful and unspoiled. 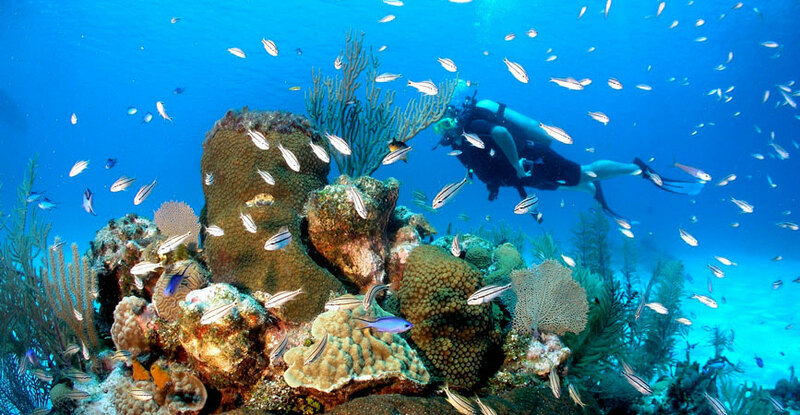 Roatán’s reef offers some of the most spectacular diving and snorkeling in the Western Caribbean. It has over 50 dive sites that are characterized by spectacular crevices and tunnels opening to breathtaking walls. You will have excellent visibility, abundant fish and brilliant corals. Most sites are within 10-20 minutes from Turquoise Bay Resort. Turquoise Bay Resort offers the ultimate of guest comfort and luxury with tastefully decorated air conditioned rooms, satellite TV, and amenities including a fresh water swimming pool. It is located on the east end of the north shore of Roatán. Guests can unwind in intimate indoor and outdoor lounges. The restaurant offers an outstanding culinary selection, including sumptuous seafood, steaks, native specialties, and delicious desserts. For divers: $2,599* per person, plus tax. For non-divers: $2,099* per person, plus tax. Prices based on double occupancy per room. Nitrox and gratuities are not included. *Trip includes airfare at current rate, subject to change. Sign up early to guarantee the best rate. A $400 per person down payment will hold your spot. Space is limited.